This Time We Are Getting Flipkart Gift Vouchers Also . ◾ Download UC Browser From Here. ◾ Open The New Tab And You Will See Super Day Banners . And It Will Redirect You To A Page With A Popup For A Draw. ◾ Click On Draw And You Will Get A Prize . ◾ We Got A 20Rs And many users are getting Rs.500 Amazon Gift Vouchers . ◾ Offer Only Valid For PC Users . ◾You Can Draw Daily From 9Th To 15Th Feb .
◾ If You Win You Cannot Draw Again That Day . If You Lose 1St Draw Second Draw can be use .If You Win In First Spin Second Spin can’t be use . 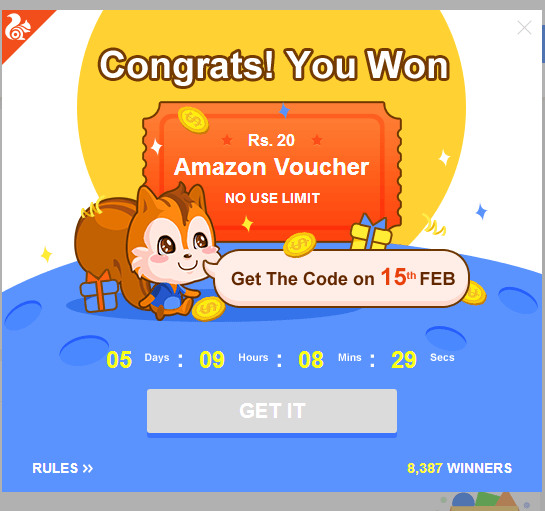 ◾ If You Win, Open Same Link In UC Browser To See Your Prize Code On 15 Th Feb .